I finished the beret in the past week but haven't been home during daylight hours to snap a photo for you. Here it is. Please forgive the poor lighting; the funny, close-up of my head; and the bad photo styling. I'm doing what I can with what resources I have! I think this would look better with a lighter weight yarn. This is also wool, so I'm sure some washing will felt this right up. 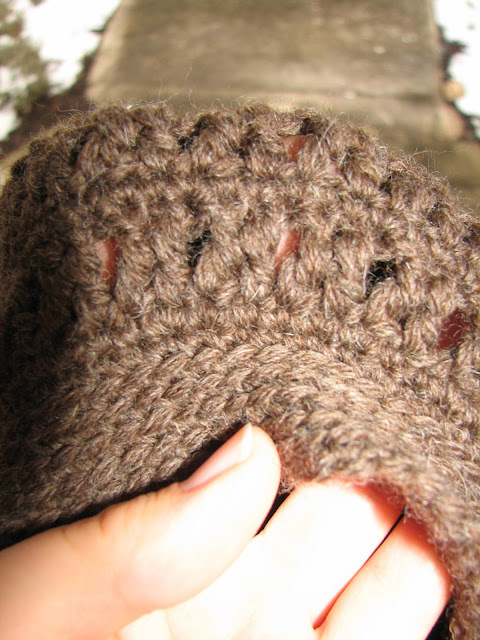 The pattern is by Jennifer L. Appleby and is from Interweave Crochet's Winter 2007 issue. I found it to be a fun, quick pattern, though there were a few mistakes in the pattern copy I have. Either that or I managed to create more treble crosses than the pattern called for, but that didn't mess up any of the other steps and the pattern came out without much trouble. Here's a close-up of the brim and the treble crosses. I like the contrast between the two. 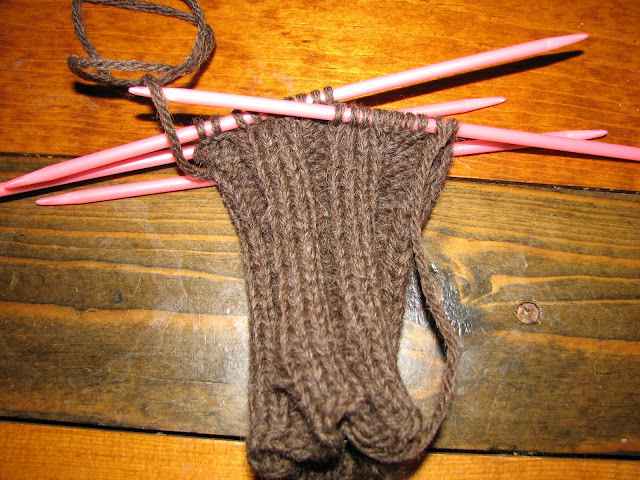 Using the same yarn (Lion Brand Fishermen's Wool) I'm making David A., a friend, a pair of fingerless mitts, using my Hubby's Fingerless Mitts pattern. David's hands are longer and wider than my husbands, so I cast on 40 stitches (for a large size) instead of 36 (medium). I may knit more than 40 rows before beginning the thumbs and palm sections since David's hands are somewhat longer. I don't know how much longer I need to make it though. A knitting/crocheting goal for the year: six sweaters! What's Needlin' Ewe, which I wrote about here, is hosting a 2011 Sweater Challenge and I think I'm going to participate! The store is challenging knitters and crocheters to complete a sweater every two months through December 2011. That means six sweaters in 12 months. Only one of them can be a baby or child's sweater; the rest must be adult-sized garments. They can, however, be summer, winter or fall garments and that includes tanks and cardigans! I have several patterns running through my mind and I'm trying to decide which ones I want to tackle.